"Here we go, with Miles Davis and the Quintet, from Birdland, with 'All of Me'..."
"And now, Miles Davis and the quintet play 'Four'..."
Voiceover 1:14-1:31. "Ladies and gentlemen, you've been listening to ABC's Dancing Party, coming to you from Birdland, the jazz corner of the world, at 1678 Broadway, New York City, between 52nd and 53rd Streets. Tonight we feature the music of Miles Davis and his quintet..."
I'm unsure of the exact date of this recording, originally issued on an AFRS transcription. Davis was out of commission for a while in late September following surgery. The Quintet -- with Sonny Rollins, Red Garland, Paul Chambers, and Art Taylor -- was booked at Café Bohemia for four weeks (August 31-September 27), but the first post-surgery engagement was apparently at Café Bohemia in mid-October (October 11-16), followed by a two-week stay at Birdland (October 17-30). Sonny Rollins left the Quintet to form his own band, probably during Davis's recovery. Soon thereafter Davis fired Taylor and Garland. For replacements he found Bobby Jaspar, Tommy Flanagan, and Jimmy Cobb. Cobb soon left, to be replaced by Philly Joe Jones. Cannonball Adderley replaced Jaspar in the Quintet in early October, and he was in place for the October Café Bohemia and Birdland dates. It's possible that Adderley replaced Jaspar during one of these engagements, but the saxophonist here is definitely Jaspar. During the Birdland gig the Quintet (with Adderley) played a one-night performance at Philadelphia's Convention Hall (October 19). 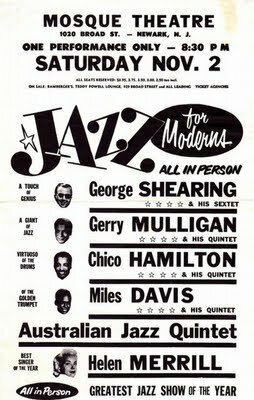 The Davis Quintet, along with groups led by George Shearing, Gerry Mulligan, Chico Hamilton, and Helen Merrill, then participated in the "Jazz for Moderns" tour which lasted until late November. Some of the venues: Mosque Theatre, Newark (Nov 2); Syria Mosque, Pittsburgh (Nov 5); Kiel Opera House, St. Louis (Nov 12); Kansas City Auditorium (Nov 13); Huff Gymnasium, Urbana-Champaign (Nov 14); Orchestra Hall, Chicago (Nov 15); Masonic Auditorium, Cleveland (Nov 16); Masonic Temple, Detroit (Nov 17); Auditorium Theatre, Rochester (Nov 17); Carnegie Hall, New York (Nov 22); National Guard Armory, Washington (Nov 23). Davis put the Quintet on hold in late November as he traveled to Paris for a three week residency at the Club St. Germain. He returned to the U.S. on December 20 and the Quintet played a one-week engagement at Chicago's Sutherland Lounge (December 24-29). Thanks to Chris DeVito and Jim Rowan for help with this date.